The general ledger (GL) is the main ledger and contains all the accounts a business uses in its double entry bookkeeping system. The purpose of the general ledger book is to provide a permanent record of all financial transactions and balances classified by account. Postings to the general ledger come from the books of prime entry and the ledger is therefore sometimes known as the book of final entry or the book of secondary entry. The ledger contains accounts for all items listed in the accounting equation, i.e. assets, liabilities and equity. Of course equity includes capital, revenue, expenses, gains, losses, drawings, and retained earnings, so the ledger must at least include GL account codes for each of these groups. The full GL account codes list known as the chart of accounts will depend on the type and size of the business, i.e. the ledger for a small business does not need as many accounts as a large corporation, a service business does not need inventory accounts etc. Appropriate use of general ledger account numbers allows the business to easily identify accounts and enables the posting and journalizing of double entry bookkeeping transactions and production of the trial balance and financial statements. The table below shows an example of a three digit general ledger numbering system. In the above table the general ledger expense accounts group has the range 600-799, so as an example the electricity expense might have the code 640. The business updates the ledger by copying each of the entries in the books of prime entry to the appropriate account in the ledger. This updating process is referred to as posting the general ledger. Our special journals to general ledger entries post shows examples of typical GL postings. 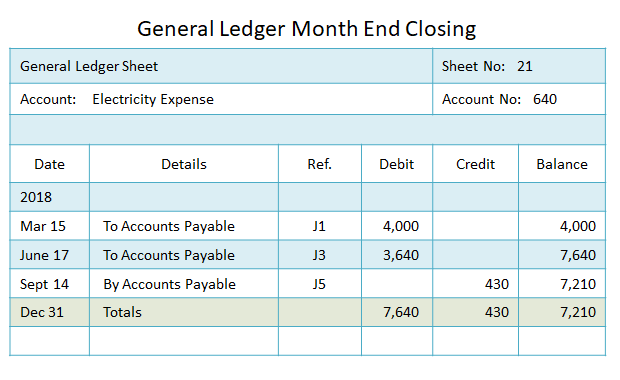 A typical general ledger sheet includes columns for date, description, journal reference, debit, credit, and balance as shown in the example below. 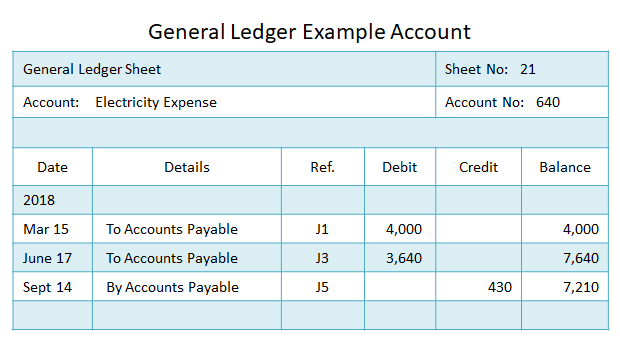 The example shows the electricity expense account which is on page 21 of the ledger. The name of the account ‘Electricity Expense’ and its account code 640 are also shown in the heading. The next line shows the headings used for each of the ledger accounting transaction entries. Date – The date of the transaction. Details – Details of the transaction such as a reference to the journal or an indication of the account containing the other side of the double entry. Ref. – A reference to the book of prime entry or journal. (At this stage a similar reference back to this ledger is added in the book of prime entry). Debit – The debit amount. Balance – The net balance of all debits and credits on the account. Only the final three columns debit, credit, and balance include monetary amounts and for this reason the format shown is referred to as a 3 column general ledger. A sample GL ledger paper in PDF format is available for download here. At the month end the difference between the total debits and the total credits on each account represents the balance on the account. We discuss the process of balancing the account in our post on balancing off accounts. The next step in the general ledger and financial reporting cycle is to prepare an unadjusted trial balance. The trial balance is simply a list of all the account balances in the general ledger at a given date and is useful for checking the arithmetic accuracy and correctness of the bookkeeping entries in the ledger. A small business will maintain all its accounting records using a single general ledger supported by the books of prime entry such as day-books and journals together with accounting source documents. As the business grows and the number of accounting staff increases it is impractical to have only one ledger and it is common to split off sections of the main ledger into separate subledgers. There are many ways to separate the general ledger into groups of accounts with common characteristics, these are more fully discussed in our subsidiary ledgers in accounting post. For a small business the most common way to split the ledger is into four subledgers. Nominal ledger with all income statement revenue and expense accounts. Accounts payable ledger holding individual accounts of suppliers. Accounts receivable ledger with individual accounts of customers. Cash book showing the details of all cash receipts and payments. Any accounts not in these ledgers such as asset, liability, and capital accounts remain in the general ledger. As with the main ledger, postings to the subledgers are from the books prime entry. Separating these accounts from the main ledger removes a large amount of detail and allows different staff to work on different aspects of the accounting records. The general ledger will normally contain a control account for each subledger. The postings to the control accounts are from the summary totals in the books of prime entry. The postings to the subledgers are from the individual detailed entries in the books of prime entry. Since both sets of entries derive from the same source the use of a control account allows the carrying out of a general ledger reconciliation. This process is more fully explained in our control accounts post. 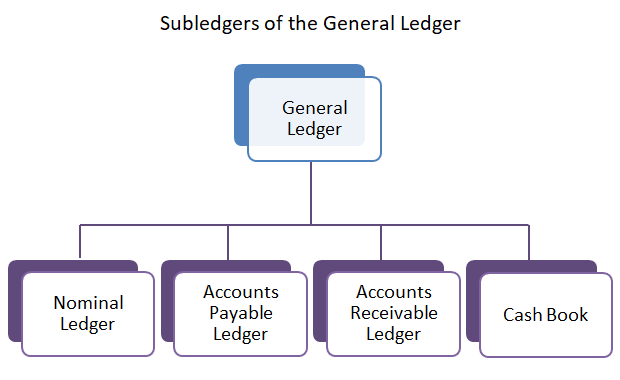 If a business uses control accounts, there are two options with subledgers, either the subledger itself forms part of the double entry bookkeeping system and the control account is for information only, or the control account forms part of the double entry system, and the subledger is for information and analysis purposes only. Either is acceptable.